Food insecurity, at the heart of a great number of conflicts, should be considered a matter of world security if the international community wants to succeed in achieving long-lasting peace. ROME, May 11 2016 (IPS) - Desperate, frustrated, and with little hope for the future, on 17h December 2010, the Tunisian Mohamed Bouazizi doused himself in petrol and set himself alight. Thus began the popular revolution that toppled the dictatorship of Zine El AbidineBen Ali, in power since 1987, and with it a domino effect that spread across North Africa and the Middle East. The events took place in the small city of SidiBouzid but they could have taken place in any other part of the world so deeply affected by the high price of goods as basic and vital as bread. Paradoxically, Mohamed sold fruit and his dream was to buy a van and see his business grow. The global food price crisis in 2008 coincided with revolts in over 40 countries and the fall of several governments such as in Egypt and Libya, highlighting the link between food security and political instability. The protests in Tunisia and other countries were initially demonstrations against the high price of food. This was not the only cause but rather the trigger of deep-rooted public indignation, although there was a common denominator. In 2011, a similar rise in food prices led to new internal conflicts or exacerbated old ones in many countries, as can be seen in the diagram accompanying this article; when the price of foodstuffs reaches extreme levels, political instability and civil unrest is clear for all to see. The lack of food, or to be more precise, the ability to acquire food – that is, poverty – is one of the most immediate threats to security and to people’s lives in conflicts, and at the same time makes conflicts more drawn-out affairs. There can be no peace without food security, and no food security without peace. They are two concepts in symbiosis. When FAO was created in 1945, the world was only just emerging from the Second World War and its founders knew that the Organization should play a vital role in the search for peace. That is why, even then, they stated in their first session that “the Food and Agriculture Organization is born out of the need for peace as well as the need for freedom from want. The two are interdependent. Progress toward freedom from want is essential to lasting peace”. Seventy years after the creation of FAO, the international community has strengthened this idea by adopting the 2030 Agenda for Sustainable Development, based on the premise that there can be no sustainable development without peace, and there can be no peace without sustainable development. The link between food and peace was also behind the award of the 1949 Nobel Prize for Peace to Lord Boyd Orr, the first FAO Director-General. On awarding the prize, the Chair of the Nobel Committee quoted from Lord Boyd Orr’s Welfare and Peace: “We must conquer hunger and want, because hunger and want in the midst of plenty are a fatal flaw and a blot on our civilization. They are one of the fundamental causes of war. But it is no use trying to build the new world from the top down, with political ideas of spheres of influence and so on. We have to build it from the bottom upwards, and provide first the primary necessities of life for the people who have never had them, and build from the slums of this country upwards. ”This is why food security is a prerequisite for peace and world security, and why hunger should be considered a matter of world security. This is even more the case in a globalized world, where something happening in one territory affects the rest of the world. This is also why measures to stabilize food prices and social protection networks are vital instruments to prevent violent conflicts. All of this is why FAO Director-General José Graziano da Silva has launched a clear signal to the international community of the urgent need to challenge head on the issue of food insecurity in the widest sense of the term. In March he addressed the UN Security Council to highlight the interdependence of hunger and conflict, as well as how hunger destabilizes societies and aggravates political instability. Following this, the Security Council has requested that FAO keeps Council members regularly informed regarding the food situation in the world’s most crisis-hit countries. Eradicating hunger is, then, not only a moral obligation, but something vital to guarantee a future for all of us. Improving food security can help to construct a sustainable peace, and even prevent future conflicts. We know that action promoting food security can help to prevent crises, mitigate their impact, and foster post-conflict recovery. It is clear that for us to prevent conflicts we must address their root causes, and amongst these are hunger and food insecurity. Conflicts are a key factor in prolonged food security crises and the vicious circle is repeated time and again. During conflicts people are three times more likely to suffer hunger than in the rest of the developing world, while those countries with the highest levels of food insecurity are also those countries most affected by conflicts. This is evidenced in examples from Syria and Yemen to South Sudan and Somalia. Other examples demonstrate that peace and food security are mutually dependent, such as post-conflict Angola and Nicaragua, or Rwanda after the genocide and East Timor after gaining independence. Without food security, there is the danger of relapsing into violence. If attempts to secure food security fail, attempts to stabilize society come under threat: a threat currently facing Yemen and also Central African Republic, where half of the population suffer food insecurity. This was in fact the main subject of a conversation between the FAO Director-General and the new President of the Central African Republic, Faustin-Archange Touadera. He asked for FAO’s support to help disarm and reintegrate armed groups in the country successfully, intensifying efforts in the agricultural sector so that the sector can meet the population’s basic needs. Promoting rural development can also help efforts to build peace. A specific, current example is FAO’s joint work with the Colombian government to implement programmes to improve food security and rural development quickly in an attempt to consolidate the anticipated peace agreement. International efforts towards peace will be more effective if they include measures to build resilience in families and rural communities, since it is they and their livelihoods that conflicts harm most. However, to achieve all of this, hunger, at the heart of a great number of conflicts, should be considered a matter of world security. 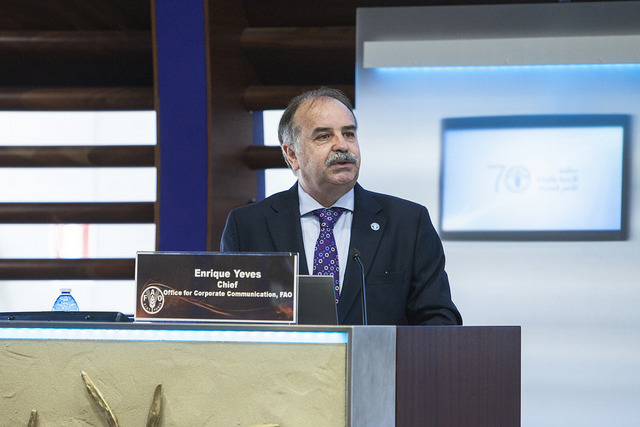 Enrique Yeves is a journalist specializing in international politics. He is currently FAO Director of Corporate Communications.